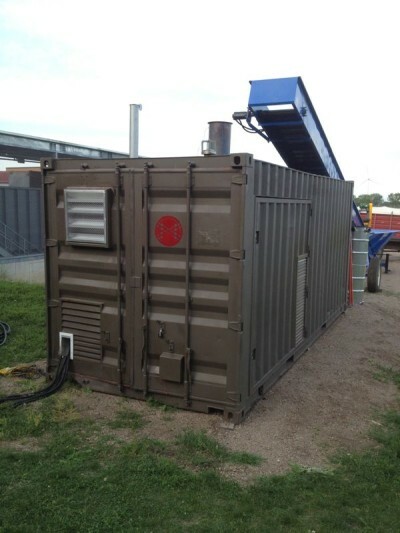 The ALL Power Labs 150kW Powertainer (PT150) is a compact and cost-optimized biomass power generation system, enclosed within a standard 20’ shipping container. 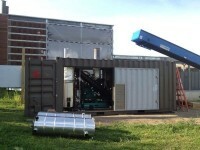 The system is fully automated and complete: from biomass hopper, gasifier and gas filtering, to engine, generator and electrical output control – all within the shipping container envelope. The PT150 is total-system-in-a box solution, with similar ease of use and transport that we have built into our popular PP20 gensets. You will be able to drop it off the truck and run – with little or no onsite construction required. Originally developed as 100 kW system as part of a US Dept of Energy project with the University of Minnesota, Morris, Cummins Power, and the Diesel Research Lab of U of Minnesota, Twin Cities, a $2M USD grant from the California Energy Commission (CEC) has allowed us to develop a commercial 150 kW version of the Powertainer. 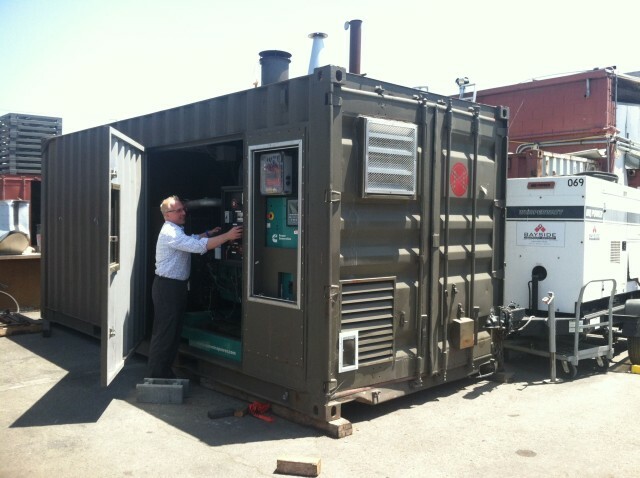 Along with project partners from UC Berkeley, Sierra Pacific Industries, and the Placer County Air Pollution Control District, APL is building a modular power plant targeted at converting forest-fire-remediation waste into on-site, on-demand clean energy. Read California Agriculture magazine’s article about the CEC project and the Powertainer. Although we are interested in partnering with parties that might be interested in pilot systems during our development process, commercial availability and pricing for the Powertainer has not been finalized. We expect to have a beta prototype ready for demonstrations by Q3 of 2018, and to deliver the first commercial units by Q4 2018. We are applying everything we have learned in the design, manufacture and operation of hundreds of Power Pallets into this new machine, scaling up our patented TOTTI architecture, while incorporating numerous improvements and new ideas. Biomass Consumption Rate: @1.0 kg ~ 1kWe/hr, dry basis. Biomass Type Requirements: Lignocellulistic, woody biomass chips/chunks in size range of 12-50 mm (0.5 in– 2 in), up to 40% moisture content. Onboard Hopper Capacity: Built-in, top-loading hopper holds approximately 400cu/ft of biomass, usually adequate for a 24+hr run at full load. Engine type: Customized Cummins KTA19 industrial, L6, spark fired, designed for natural-gas fuel. Electrical Power Output: Approximately 150kw, at 240 VAC, 480 VAC, 50hz or 60hz three phase. Actual power output varies with biomass fuel type, moisture, and system configuration.